After a bit of delay, here (direct link) is the promised downloadable pdf of the Character Creation Worksheet for Holmes Basic. You can also get to it via the Holmes Ref page. I tweaked the sheet a bit more, but not much. I moved the Prime Requisite adjustment from step #2 to its own step (#3), so there are ten steps now. Note that Holmes omits any mention of elves from the section on Adjusting Ability Scores. Previous posts about this sheet can be found here and here. This is probably the most specialized set of dice I've ever made, and it will appeal only to those who are as enamored with "old school" role-playing games as I am. The original Basic Dungeons & Dragons game had tables in it for "random encounters" or "wandering monsters". If something was encountered by an adventuring party, the dungeon master was supposed to roll a twelve sided die and refer to one of three tables (depending upon what "level" of the dungeon the party was on -- the rulebook only considered dungeons of depth down to level three). Click here to read the rest of his post. Click here to read about changes to the Level 1-3 Wandering Monster Tables from OD&D Vol III to Greyhawk to the three printings of Holmes Basic. It wasn't long after D&D was released 1974 that fans began tinkering with the rules. One of the earliest published variants was Warlock in the the Spartan Gaming Journal in August 1975. Holmes used this system in the games he ran with his sons prior to editing the Basic Set, and I've written about the possible influence of these rules on Holmes Basic. In Dragon #52, Holmes wrote that he tried to convince Gygax to include a spell point system in Basic D&D. As we know from the lack of these rules in D&D, Gary was not persuaded. When Warlock was published the only published D&D books were the original set and the Greyhawk supplement, both of which it references. Now that these first two publications are available again as pdfs, it is a good time to go back and take a look at this spell point system that Holmes was a fan of. The presentation in Warlock is a bit scattershot, like the OD&D rules themselves, so I've tried to re-organize it here. Above I've quoted a bit of Warlock's theory behind using spell points: M-U spells have two qualities, complexity (level) and effort required (spell points). Thus each spell is additionally assigned a spell point usage cost. Note the HD system in Warlock is similar to the original d6-based HD system, with a M-U only getting a full d6 HD every other level. So HD here is not the same as Level. Note also that Warlock uses the original OD&D Con modifier to HP (Con > 15 = +1 HP/HD, Con < 6 = -1 HP/HD), so a high Con only gives a small bonus to spell points. "Life-Saving Margin": A M-U can exceed the SP only to safe own life. This extra margin is the same as the character's "Death Level", which is the number of HP between unconsciousness and death (i.e., the "death's door" rule in later systems). The calculation for the "Death Level" is explained in the section on combat (pg 29) and uses a complex formula: .03 x HP x CON score. The example given is a 10 HP character with 15 CON, yielding a 4.5 HP "Death Level" (.03 x 10 x 15), meaning the character can go to -4.5 HP before dying. Spell points get the same margin as Death Level, but when M-Us go below it they suffer the following consequences in lieu of dying: unconsciousness for d6 turns, movement slowed by one step, and loss of all other casting for the day (i.e., since they have no spell points left). Memorization rules: This system is not "free casting". Despite having spell points, a M-U can still only cast based on what spells are known, and what is memorized. At lower levels, the memorization tables are the same as OD&D; e.g. a 1st level MU can memorize one 1st level spell/day; a 3rd level M-U can memorize two 1st level and one 2nd level spells. Higher levels have some changes and go all the way up to level 40 (!). Warlock does not include the "% chance to know" table from Greyhawk, but does suggest limiting available spells: "In beginning a series of games it is worthwhile to limit the spells available to magic-users. This gives them incentive for finding the lairs of hostile magic-users (in order find books of spells) or researching new spells" (pg 8). Warlock adds many spells to each level, but I've only listed the LBB & Greyhawk spells. Warlock mentions that they have only included some of the Greyhawk spells; others have their level changed. Obviously this system was first worked out for the original spells and the new Greyhawk spells provided some complications. A 1st level M-U will have an average of 3-4 HP, and thus 4-5 spell points (SP), with a potential max of up to 9 spell points (6 for HP + 1 for high Con + 1 for Level + 1 for high Int). A single 1st level spell can be memorized. An average MU will be able to cast one of the of the more powerful 1st level spells (Sleep, Charm Person), but an above average MU with more points may be able to cast one of these spells twice. Detect/Read Spells that only cost one point may be cast multiple times if chosen as the memorized spell. A 3rd level M-U will have an average of 7 HP, and thus 10 SP with a potential max of 19 SP (12 HP + 2 for high Con + 3 for Level + 2 for high Int). Two 1st level and one 2nd level spell can be memorized. Magic Missile is a 2nd level spell in these rules with a cost of 4 +1/missile. An average M-U can cast Magic Missile and produce 1-5 missiles for 5-9 SP. An above average M-U with 18 SP could (among other options) cast Magic Missile three times with two missiles per casting for a total of 18 SP. Since this system layers on top of the existing memorization rules, it should be adaptable as an option for most OSR systems. It will be most easily used with systems similar to the original D&D rules (Swords & Wizardry Whitebox; Delving Deeper). Modification of the spell point formula/costs may be necessary for systems using a d4 HD and/or with higher HP and Int modifiers. A drawback is that it makes a M-U's power level much more dependent on HP rolls and Con bonuses. The complications during play will be tracking spell points and remembering the varying spell point cost for each spell. Players should be able to write down this number next to the spell on their sheet and use it to keep track of their spell points when casting. Being able to cast additional spells will provide motivation for this extra work. It will be more of a pain for DMs because they will need to look up and track this for every NPC M-U. In honor of the newly released Whitebox OD&D pdfs, let's take a look at the first class added to those rules: the Thief. Not the commonly known version in the 1975 Greyhawk supplement, but the even earlier one in the Great Plains Game Players Newsletter (May 1974), from just a few months after those first D&D sets were released. Jon Peterson helpfully shared this material with us in a post back in 2012. As Gygax acknowledges in the article, he got the idea from a phone conversation with Gary Switzer, owner of Aero Hobbies in LA, "who mentioned that his group was developing a new class of character -- thieves" and "gave me a few details of how they were considering this character type, and from these I have constructed tentative rules for this class". In Switzer's group the original idea was by D. Daniel Wagner, who talks about it here in the OD&D Discussion Forums. Wagner later co-wrote the Manual of Aurania, and a few years ago he let me post some of the Aurania material on the blog here. The "Great Plains Thief" very much resembles the Greyhawk thief, but there are differences. In general the original version has less limitations and is more forgiving (less chances for failure). Furthermore, the write-up provides examples and clarifications on the second page that are not found in Greyhawk. -Hit Dice. 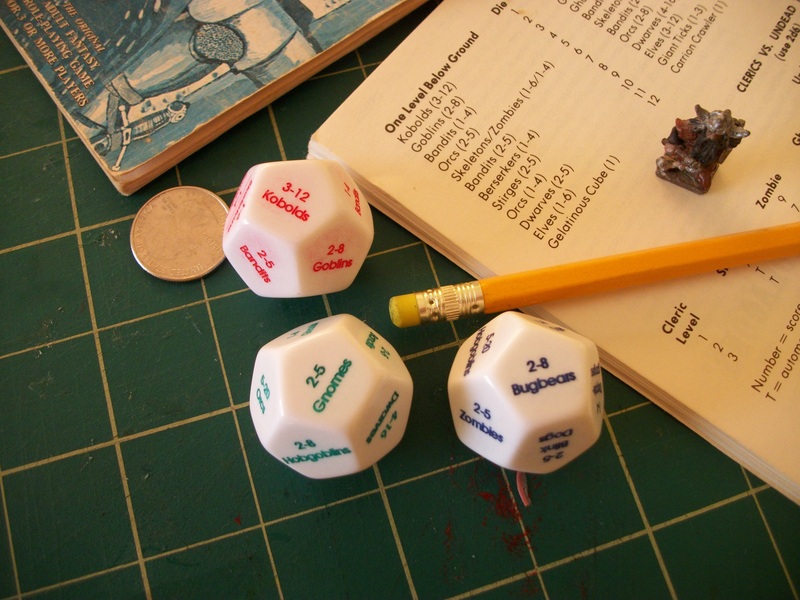 Most notably, the Great Plains Thief uses the original d6 system for hit dice, where all classes use d6s. For the thief this means 1d6 at level 1, 1d6+1 HD at level 2, 2d6 at level 3, etc. This really gives this version a "LBB" feel. Greyhawk only presents thieves using the "alternate hit dice" where they get a d4 hit dice per level. -Race. The Great Plains write-up simply says, "Men, Dwarves, Elves, or Hobbits may become thieves", and nothing more. So the class is open to all of the standard races of the LBBs without any mention of the more complicated concepts added in Greyhawk such as multi-classing and racial bonuses for the non-humans. -Alignment. The Great Plains Thief is "always neutral". The Greyhawk version adds chaotic to this, plus a note that lawful characters can employ them on a limited basis for missions. -Armor. The original write-up lacks the clarifying note found in Greyhawk that shields are not allowed, thus rendering it ambiguous whether they can use shields. -Climb Walls. The Great Plains Thief has this ability, described as "Climb almost sheer surfaces rapidly, up or down", but no chances are given, implying it is automatic. Greyhawk introduces a chance of failure (13% at level 1). -No "Pick Pockets". A skill of this type is present in the original write-up but does not yet have its standard name; instead it is "Steal items by stealth and/or sleight-of-hand", which to me implies a broader skill than just "picking pockets". Furthermore, this ability is not listed in the table of chances; instead the example on the second page indicates that the chance is the same as move silently. In Greyhawk it was changed to "filch items and pick pockets" in the list of skills and just "Pickpocket" in the table, where it is still given a chance equivalent to move silently. -Finding Traps is automatic. Notably, in the example in the original write-up the thief finds traps in two chests simply by examining them, without any rolling. Only removal requires a roll, with failure activating "it with regard to the thief and any others within its range". This idea would persist into Greyhawk, Holmes Basic and Moldvay Basic where there is a "Remove Traps" but no "Find Traps" skill for thieves. -Open locks saves time. In the original example, Gygax notes that failure to open a lock means that it "must be forced open - a very time consuming process". Also note that both here and in Greyhawk the skill is described as "by picking or even foiling magical closures". This is not explained further, but one could rule that this includes opening Hold Portal or Wizard Locked doors. -Reading languages and scrolls are automatic. Greyhawk adds chances for failure, but that's not in the rules here. -Hide in Shadows allows movement. The second page clarifies that is a chance to "remain undetected when hiding or moving through shadows" (so the thief doesn't have to remain still), requires shadows "of course", and a lack of "observation prior to hiding". In the example, the thief is able to avoid observation by a pursuing monster simply by hiding once the party goes around a corner. To make the original material more usable for gaming, I've edited the material into a single page "Thieves Reference Sheet". I took the Holmes approach here, attempting to retain as many of Gygax's original words as possible. It's digest-sized (a 8.5 x 5.5 sheet), so it will fit inside your virtual or real Whitebox.